The owner of the Park Hotel told us that he was in the King Club, and we scratched our heads not knowing that Hungarians were so into Elvis … but, hey, okay. He meant the King Pigeon Club. We then were shown numerous magazine articles about King pigeons. Really interesting birds, no really. Did we mention that when we attempted to check into the hotel no one was there … for a long time. After about half an hour Paul figured out how to call the hotel on his cellphone. Luckily, he got an answer as we were about to set off looking for another place. Good thing we did not as there was nothing else to be found. and a good place for drinks and dinner. Tonight we are in a four-star in Vukovar along the Danube. Pre-war this city had a population of 35,000, but that was reduced to 500 during the fighting. There are many bombed out buildings, and we did see some mine fields today. We relieved ourselves very close to roadside in these areas. Tomorrow night who knows where we will be … we have been going essentially by Braille so far. We expect to do about 15 days of riding over a route that is about 1,600km or roughly 1,000 miles long. The route that we are riding is called the Euro Velo 6. 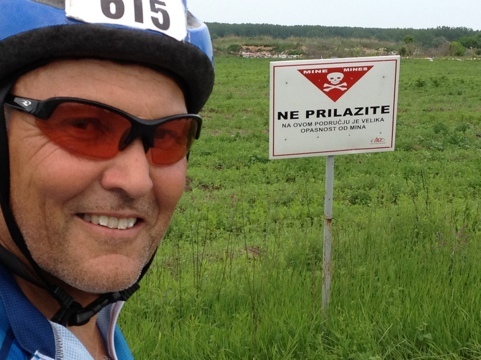 We are riding well and near the border of Croatia. Day one was a metric century plus. Day two was 135km, which by the way is about 80 miles. Rain has been very heavy at times with thunderstorms. 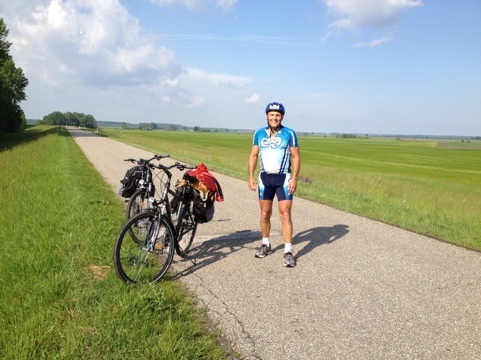 We have been riding on grass and dirt for long stretches … 25km plus. With the heavy rains, we have encountered lots of deep mushy mud. Georgie’s shop was great, and the bikes are doing well. We have bells on the bikes that we ring at sheep, cows, donkeys, deer, and anything else we see that has the potential for movement. The Danube is very pretty. Accommodations are sparse. Hiding from a massive thunderstorm. Heading off now at 9am on May 24. More to follow but typing on the iPad is very slow. In the last week before leaving for Europe Paul did get in a few 30-mile bike rides and one 47-mile ride in windy Maine, but most of his training was farm work on his Bondgarden Farm (www.bondgarden.net) in Eliot, Maine. 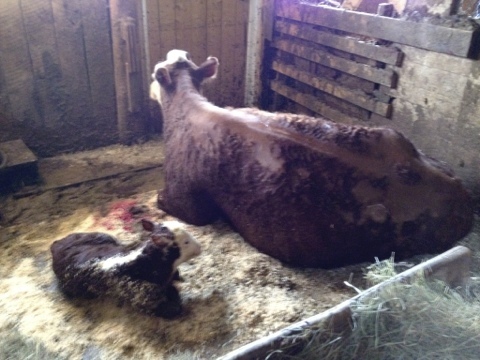 The most challenging activity was the birth of the second calf of the spring, which was very difficult. The calf had to be pulled out with ropes and then bottle fed with milk hand-milked from the kicking mother for two days. Paul arrived in Sweden on Friday and picked up Ray in Copenhagen on Saturday morning. Ray had travelled about 25 hours from Chiang Mai, Thailand. They then spent the last two days partying with Paul’s cousin Kjell-Ake at their farm in Smaland, Sweden. Our training has been going well. Paul has been working the farm delivering baby cows and what not, and Ray has been scuba diving in Yap and Palawan … But, in an effort to do a couple more training rides, the day after returning to Chiang Mai, Ray set out on a century ride to Fang. Well, there was email to catch up on and bills to pay (no Internet on a live aboard in the middle of nowhere), so he did not get out of the condo until noon. By then it was blazing hot outside, say over 150F with the heat index. (I am not making these numbers up. Check out NOAA’s page for heat index, skip over the wind chill stuff, which never applies to Thailand. You will see the most-relevant table entry at 105F and 60% humidity and a heat index of 149F. I guess they assume no one is out biking in 105F with 90% humidity, so they don’t show those values. Or, maybe the guy doing the “experiments” passed out at that point of the research. Anyway, for the extra 30% humidity, I added just one degree.) Bottom-line: absurdly hot. The ride to Fang includes several climbs. The longest climb is probably about 3 miles. Not too steep (7%), and nothing compared to Doi Ang Kang. With fresh legs I hammered the entire ride. Well, when I felt goose bumps from over heating, I did back it down a bit. My average speed was 15mph, which on my mountain bike with 2.25-inch off road tires and traffic in some areas, is not exactly hanging around. 🙂 (Yeah, I know whine whine whine …) For reasons unknown to me, the only food I ate that day consisted of one bag (small) of potato chips and pad pak ruam (mixed vegetables). What was I thinking? And, the vegetables were crazy spicy, which Paul would have loved. Now, where was I going with this post, oh yeah, the fireplace. Picture a heat index that is not even available on the NOAA charts. Picture me falling apart after 5 miles. I said five. Now picture a guy riding a regular bicycle in these conditions with a side-mounted fireplace. Normal bike, and I said side-mounted fireplace. It was a black box, dimensions in feet 2 by 1 by 1, and he was burning in it … get out of here … I am not kidding. I double and tripled checked, yes, he had a fire going. Was it incense? Was he cooking something to sell? It didn’t smell like burnt squid … Wow! I just looked down at the salt on my shorts and kept riding. I know that I was delirious, but it was a fireplace. When I got back to Chiang Mai, I went out for a massage. Legs were trashed … badly trashed … and, I was, of course, badly dehydrated. But, I guess that is why people invented beer … 🙂 There was Thai tea, orange juice, banana shakes, water, and so on too … needless to say, I was totally ravenous, and I did have a huge dinner. All systems are go. We are excited. Paul and I will meet in Copenhagen on this Saturday morning, 19/5/2012. What about our bikes? We don’t have any yet, but we have been communicating with a bike shop in Budapest. We decided rather than shipping bikes to Europe, we would “simply” buy some new bikes in Budapest. Yes, I said, simply. Well, the emails have been going back and forth, and it looks like we will be riding the Kross Trans-Siberian. I know the first thing that came to your mind when you saw this bike, was, well, Alimra Gultch. Tell me you are not humming “that” song right now? We hope to secure the bikes on the day of our arrival in Budapest. The bikes are a hybrid bike somewhere between a rock and a hard seat … I mean road and mountain bike. We will likely equip the bikes with computers (speed and distance at least) and rear panniers. We are busy with deciding on our final gear list. Paul and Ray have both previously biked across the USA and that experience is coming in handy … meaning that we have been procrastinating a little since this ride is only one third of the distance. But, by no means are we really underestimating the difficulty of this ride. We suspect the language barrier and poor road signs will have us pedaling loops at some point. And, weather could be a factor. We may try to sell the bikes in Romania or possibly ship them back to Thailand for future rides there when Paul comes to visit. We have roughed out a draft schedule showing daily mileages. At the moment we have built in a couple of rest days. This means that we will be riding many days of about 70 miles per day. I mean back-to-back-to-back 70s. Of course, we would like to get in a couple of dives in the Black Sea at the end of the ride, but we must not get ahead of ourselves. Did someone say lock and water bottles? Thank you. Today I, Ray, went out for a metric century in about 110F … note that there was humidity too … BTW, Thailand has three seasons: hot, very hot, and (expletive deleted) hot. We are in the latter season now … The Sameong Loop from downtown Chiang Mai is about 60 miles. I absolutely hammered the ride the entire way. The good news is that I held strong the entire ride. It was a 4 hour and 24 minute push. In the first 5k I almost crashed into a wandering dog at 20mph, and almost got hit by a truck that merged into “my space.” On the return I needed to ride around the Chiang Mai Moat … there you almost always get killed, so I will not write about all those “normal” close calls.